This recipe is a secret. I am sharing it with just a few select people. Why? Because this dessert is so opulently rich and sinful that very few people deserve this much pleasure. Think I'm kidding? You won't once you have tried it. The recipe is really very simple and involves only two basic ingredients: chocolate and eggs. The result is a dessert that is so rich and delicious that you are going to feel quite guilty after eating it. There are two layers in this pudding. Each contains approximately the same ingredients as the other, but differences in the preparation produce two very distinct but complementary layers. Combined, the two layers form a dessert that you will remember for a long time. You will want to make this one again and again. Allow to cool in a refrigerator. Spoon the first layer pudding over the second layer pudding and serve. Layer One is a very rich, thick chocolate custard. Layer Two has the consistency of sponge cake. 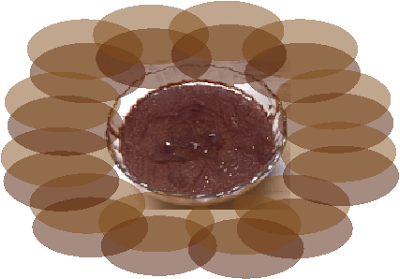 The combination of the two layers forms the "double chocolate" pudding. This recipe is a development of an original recipe for Manx Chocolate Mousse. I have deviated from the original recipe a little but I am sure you will agree that the end result is very well worth it. Warning: You will be racked with guilt for days after eating this dessert. Then, like me, you will probably make it again. Go ahead, try it today; the world may end tomorrow and this is one of those "must do before I die" things. But how large is a family-sized bar of chocolate? I looked on the site, and can't find anything so labelled. Is it the 7 ounce bar? Help! I must have chocolate! The family size bar is 200g. It sounds like a lot of chocolate to put into a dessert, but the rich taste is worth it. You could substitute other types of dark chocolate but Cadbury Bournville is perfect for two reasons. Firstly, it comes from the UK; secondly, it contains just enough cocoa to give the recipe its great chocolately flavour and just enough sugar to stop the recipe tasting too bitter.